From design to finish, Blueline Floor Coverings is the best choice for hardwood floors, carpeting, and specialty floor coverings in San Mateo County. 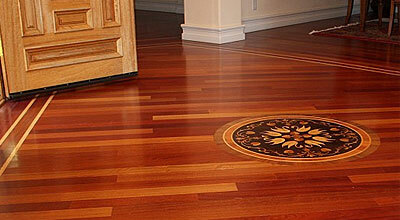 We are a family-owned, licensed C-15 flooring contractor with over 20 years of experience in flooring sales, installation, refinishing, repair, and restoration for homes and businesses in San Mateo, Belmont, San Carlos, Burlingame, and surrounding areas. Over the years hundreds of home builders, general contractors, property managers, and homeowners have come to rely on us for our expert craftsmanship, competitive prices, and superior customer service, which has earned us a solid 5-star rating on Yelp. 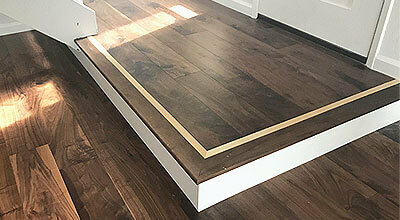 We welcome residential and commercial flooring jobs of all sizes, from installing hardwood floors in custom-built homes, to refinishing custom wood stairs or installing Stainmaster carpet in multi-unit office buildings. Whatever the scope of work, you can rest assured that we will always use the industry's best practices and exceptional attention to detail to achieve outstanding results. With over two decades of hands-on experience and industry knowledge, we have the skills and expertise to build, repair, and refinish hardwood flooring of all kinds, from wide plank distressed French oak, to hand scraped African mahogany. Our professional flooring installers have an average of over 10 years of experience in designing, installing, and refinishing solid hardwood floors and stairs, and installing specialty floors, such as cork and linoleum. 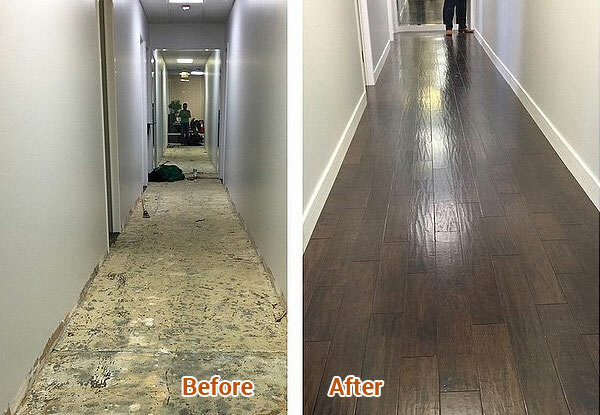 In addition, all of our flooring jobs are supervised personally by the owner or his foreman, who carefully manage each job from start to finish to ensure that every floor installation or restoration is completed to our high standards in a timely and cost-effective manner. Because of our commitment to quality, we only sell and install trusted name brand flooring and use top-rated finishes and stains from Duraseal and Bona, who are well known throughout the industry for their beautiful, long-lasting, and durable wood finishing products. 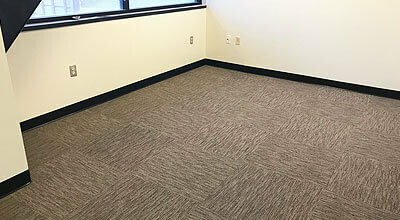 Whether you need high traffic carpet for your office building in San Carlos, custom European oak flooring for your entire home in San Mateo, or cork flooring for your child's bedroom in Belmont, Blueline Floors can deliver the ideal flooring solution at a fair and honest price. Our 1,000-square-foot San Mateo carpet and flooring showroom includes an extensive selection of solid hardwood flooring in a wide variety of premium hardwoods such as maple, oak, hickory, teak, African Mahogany, Brazilian walnut, and more. We also carry brand name wall-to-wall carpeting available in hundreds of different styles, fabrics, colors, textures, and weaves. We also carry a wide variety of cost-effective wood flooring and carpet alternatives, such as luxury vinyl tile (LVT), cork, sheet vinyl/linoleum, and rubber gym flooring. 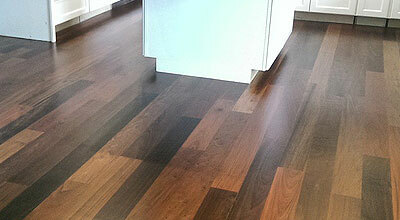 When you want the job right, choose Blueline Floors. Customer service is our number one priority, and we always go out of our way to ensure that every client receives the perfect flooring solution for their needs, budget, and lifestyle. We stand behind our workmanship with a 1-year labor warranty, and want to be sure that you are completely satisfied with our services. Unlike the big home improvement stores, you can count on us to fix any problems with the utmost professionalism, efficiency, and hassle-free service. Give us a call today to speak to one of our friendly and knowledgeable staff. Or stop by our 1,000 square foot showroom in San Mateo, conveniently located near Belmont, San Carlos, Burlingame, Redwood City, and surrounding areas. We offer free onsite consultations and competitive quotes for small and large flooring jobs from San Jose to San Francisco.